Above: Salvation Mountain, with the moon rising. The creator of a desert artwork known as Salvation Mountain has been placed in a long-term care facility in El Cajon. Now the future of the candy-colored mountain is unknown. 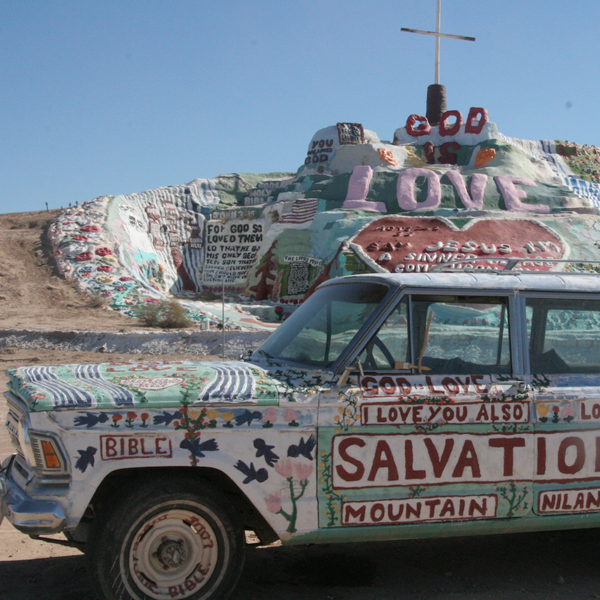 Above: Leonard Knight, outsider artist who spent years building Salvation Mountain out of adobe, straw and paint. Above: The truck where outsider artist Leonard Knight sleeps. It’s painted in the same style as his monumental work, Salvation Mountain. Leonard Knight has been building Salvation Mountain out of adobe, straw, and paint for almost 30 years. The colorful, three-story mountain with the words “God Is Love” on its crest sits in the Imperial County desert, east of San Diego. The 80-year-old Knight has lived at the mountain since 1985, sleeping in the back of a painted pick-up truck and caring for his life’s work for hours every day. I made my first pilgrimage to Salvation Mountain in 2008 and wrote about it here (starring a terrifying swarm of flies). Earlier this month, Knight was placed in a long-term care facility in El Cajon for dementia. Jo Hernandez is the executive director of Spaces, an organization that helps preserve outsider art. Spaces was instrumental in saving the Watts Towers in Los Angeles. Hernandez is referring to the over 100,000 gallons of paint Knight has used to adorn and layer the mountain. Much of that paint has been donated by the thousands of visitors who’ve wanted to support Knight’s desert dream. Without attention to deteriorating areas, sun, rain, and even earthquakes will have their way with this relatively fragile mountain. There’s also the issue of protecting the mountain from vandals. As of now, a rotating group of volunteers are monitoring it. Above: Paint cans are scattered all over the land surrounding Salvation Mountain. Above: One of the interior shrines Knight built inside a portion of Salvation Mountain. Above: A view of the sun setting from the top of Salvation Mountain. Hernandez says at her most optimistic, she thinks the mountain could be saved through a combination of financial support and non-profit oversight. She’s working with some individuals who’ve helped care for Knight and the mountain over the years to establish a non-profit to work on the mountain’s preservation. One of the first steps in determining Salvation Mountain’s future is figuring out who actually owns the land. One thing is certain, Knight has been officially trespassing since he began building his monument. The parcel of desert land in the shadow of the Chocolate Mountains was first given to California by the federal government upon statehood in 1850. It was one of the “school lands,” which were parcels in each township given to the state for the benefit of public education. Any proceeds from the sale of those lands would go to support public education. The federal government took back this desert parcel during World War II for military use – resulting in the slabs that mark nearby Slab City – and it was then returned to the state in the 1960s. The distinct boundaries of what the state actually owns as of today are unknown. Curtis Fossum is chief officer with the California State Lands Commission, which manages land for the state of California. Fossum says the state definitely owns the land neighboring Slab City is on, but he’s not sure about Salvation Mountain. The state hasn’t had the resources it would take to find out. In the coming weeks, I’ll be looking in to why Imperial County has not wanted to manage Salvation Mountain in the past and what the county’s role will be in Salvation Mountain’s future.